Paul Chaat Smith is an enrolled Comanche, veteran of the American Indian Movement in the ’60s and ’70s, and now an associate curator at the National Museum of the American Indian in Washington. His main interest is contemporary artists, and many of the essays in this volume were originally linked to particular exhibitions -- though the subjects range well beyond art. As for what the title means, "It's a book title, folks, not to be taken literally," he writes. "Of course I don't mean everything. Just Most Things. And the You really means We, as in all of Us." So this book should be of interest to Native readers as well as non-Natives. Smith has a fluid style, contemporary and anecdotal as well as incisive, so these pieces are easy to read. He's big on irony ("Alas, it's practically the only thing I know") so there's edgy humor. This is a collection, so his opinions, observations and bits of autobiography are repeated, though in different ways. That works pretty well: you won't forget what he really thinks about Dances With Wolves or his AIM experiences. Among the fascinating topics he takes on several times is the late 19th and early 20th century transition, when American Natives lost their land, with some joining the Wild West show and all becoming defined by the movies, including a very early epic about the massacre at Wounded Knee, starring actual participants on both sides. 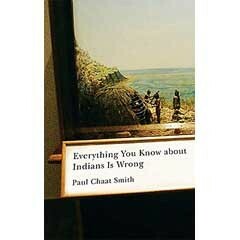 He can be provocative: "Generally speaking, white people who are interested in Indians are not very bright." He worries that Indians have bought into a limiting self-image. He's more interested in conceptual art and the installation art of James Luna, for example, who plays with traditional forms and the contemporary world, to interrogate common images and self-images of Indians today. Although Smith writes with intimate honesty about the National Museum of the American Indian, he wonders when contemporary Indian artists will see their work exhibited alongside other contemporary art. He's not advocating assimilation either. He argues that Indian peoples have always absorbed change into their cultures. His basic message for all might be this: "Good intentions aren't enough; our circumstances require more critical thinking and less passion, guilt and victimization." Even with my limited experience, I am still often surprised at the simplistic views many otherwise intelligent non-Natives have of Native peoples. But North Coast non-Native readers are more likely than most to have had authentic acquaintance with Native neighbors, so they may appreciate this sophisticated treatment. Not everyone, Native or not, is going to agree with Smith's views, but they should start some interesting arguments.